To ensure your service runs at utmost smoothness, with our team being punctual, efficient, and well prepared, we have developed some key terms to operate by. Supplies We furnish all supplies: HEPA filter vacuums, mops, organic sprays, clean cloths and brand new sponges. Arrival Windows In consideration of traffic, weather conditions, clients adding services, and lockouts, please allow a window of at least 2 hours from your scheduled appointment time. For your convenience: if you cannot be at home, providing a key or entry code access is easiest. Minimum Call Out Fee We charge minimum call out fee of $150 plus GST for all one-time services. Payment For your convenience, we accept cash, e-transfer and major credit cards. First time or one time bookings require a full prepayment on a major credit card. Recurring service payment is due upon completion of each service. A finance charge of 2% per month (24% annually) will be charged on all past due balances. A $25 fee is applied to all NSF or declined checks. Last minute Cancellation / Lock Out / Rescheduling fee: If you require a cancellation, rescheduling of your service, we kindly ask you contact us by email to [email protected]/[email protected], by 12:00PM, 2 business days before your booking (stat holidays and weekends are not business days). Example: If your service is scheduled for Tuesday, you must email us by 12:00PM the previous Friday. (Voicemails and calls to cancel services are not accepted unless you receive a confirmation email from us.) Any schedule changes within 2 business days prior to the appointment are billed up to 100% fee of the service fee in respecting our meticulous scheduling efforts, reserving a crew of workers for you, paying them for their booked time regardless. A client not home when we arrive is considered a cancellation/lock out. Waiting time fee: Should the client need the cleaning team to wait within the agreed arrival window, there is a waiting charge of $40 per hour per Cleaning Angel. Breaking Regular Schedule fee: Should a client commit to a regular schedule (at a discounted rate to the initial deeper cleaning), opting to skip 4 weeks or more requires that the immediate postponed cleaning have a longer time or charged price of initial cleaning. Parking fee: The client is expected to provide a free parking spot; otherwise the parking fee (minimum of $2) will be charged (to your credit card / invoice) in addition to the cleaning. Unsafe Condition fee: Our team reserves the right to refuse service to any client whose work site poses an undue health or safety hazard. At the point of refusal for this reason 50% of the total of the estimate becomes payable as compensation for negligence. Beyond scope of work fee: should the client require a substantially higher level of service than listed in the scope the 50% of the estimate becomes payable for rescheduling the appointment. Furniture lifting: If you require us to clean behind a fridge, shelf or furniture, please pull it out for us in advance. We do not move anything over 20 lbs. We are not a moving or handyman service. We also do not wish to scratch furniture, flooring and we take care to prevent injury of our Cleaning Angels. Dishes: We do not put away dishes, because we don’t want to stack things in a way that you would not (and to reduce risk of breakage). Bed Linens: If you requested Special Request “bed linens changed,” please leave the clean sheets ON each designated bed, otherwise your linens cannot be changed. Walls and Floor Washing: Entire washing of walls / floors by hand is beyond our regular scope of vacuuming and light duty mopping. By booking our service, you agree to floors mopped with commercial “microfibre flat mops.” Such mopping will satisfy 97% of flooring needs. We do not clean grout in between tiled floors or walls (except in showers). Other companies provide specialized “grout steam cleaning” service. 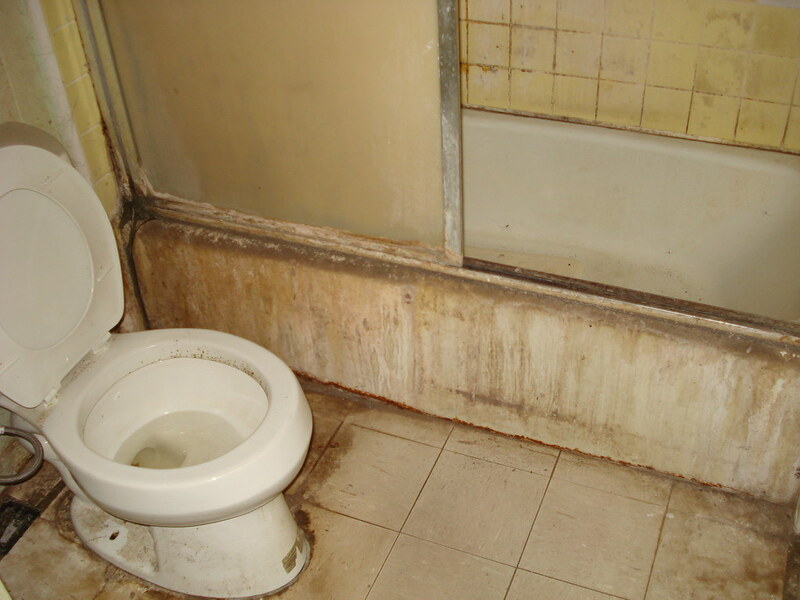 Reasonable cleaning condition… your property has obviously not been maintained, has been abused for years as in this sample photo. We hate to find ourselves in such unpleasant circumstances for both parties, but upon a rejection of job, we do charge 100% of the service fee. Client Happiness Policy To ensure your satisfaction of your initial service: Upon arrival, we require clients to do a free 5 minute Walk Through going over your Work Order. For liability protection, we hold the right to take before and after photos. Upon completion, we require clients to complete a free 5 minute Peace of Mind Walk Through and sign off upon satisfaction. Due to the subjective nature of the cleaning industry, we do not offer refunds. Complaint Validity Period: All cleaning is final 24 hours after completion. Client’s are required to give another team a chance to fix all complaints resulting from the Work Order and scope before reviews are posted to public media. As a result of cleaning, should there be any stains uncovered or caused, Cleaning With Love holds the right to repair these by whatever means, including dying, and that by agreeing to the service, the client is explicitly stating that the company can take whatever steps it deems appropriate to repair the damage. If the client or his/her representative(s) refuses to provide consent to any steps required to repair the damage, the company will only provide a monetary sum not exceeding what it would have cost the company to perform them. The company will not be liable for any expense over this. Non-Solicitation of Staff As a client, you agree not to hire any present or past staff of Cleaning With Love for any home-related service outside of your service purchases with Cleaning With Love. If you hire our cleaning staff to work privately, you must pay $5000 to our company. Confidentiality and Security As our client, we respect your privacy and dignity. We keep your information confidential and keys securely stored. As well, all documents, staff information, communication (verbal/written/media) etc. are property of Cleaning With Love. Please do not disclose to public outside of your service. As a valued client, we thank you in advance for your understanding and respect for these policies. Your cooperation will ensure your experience with our Cleaning Angels to be on the up and up!